The Decalogue (Exodus 20: 1-17) provides the fundamentals for Judaeo-Christian morality. There are several ways to number these Ten Commandments (summary in Wikipedia). I shall follow the most common of the numbering traditions – that used by most Jewish authorities and by most Protestant churches. The first four commandments deal with our relationship to God. The first is to have no other gods. This is easy to understand. The second is not to worship graven images. This has been interpreted in many ways. Though some say that it prohibits any representational art, it most likely means that such material objects should not be worshiped as divine. The fourth is to reserve one day of the week for God. This commandment to celebrate the Sabbath is only controversial in terms of which day is to be so honored and what types of work are not allowed on that day. The name of God is given by four consonants, typically transliterated as YHWH (Gianotti, 1985; Meyers, 2005, pp 57-59; Durousseau, 2014). This Tetragrammaton (“four letters”) likely comes from the Hebrew verb “to be” in the third person. The first-person version of the verb is the name used by God in the episode of the burning bush – I Am That I Am (Exodus 3:14).
. Tetragrammaton, Douglas Larsen, 2007 . The third commandment, which specifically concerns the Tetragrammaton, has been interpreted in many different ways. Since its meaning is not clear, many pious Jews never use the name of God in any secular context, and do not speak the actual name aloud during religious worship. Various substitutes are used, most commonly Adonai (my Lord) or Elohim (God). The King James Version uses Lord in small capitals to express the Tetragrammaton. Other translations have used Jehovah, adding to the Tetragrammaton’s four consonants the vowels from the word Adonai. This has no real justification. The actual sound of the name was probably more like Yahweh. Interpretations of the Third Commandment. Ancient Hebrew is not easy to translate. 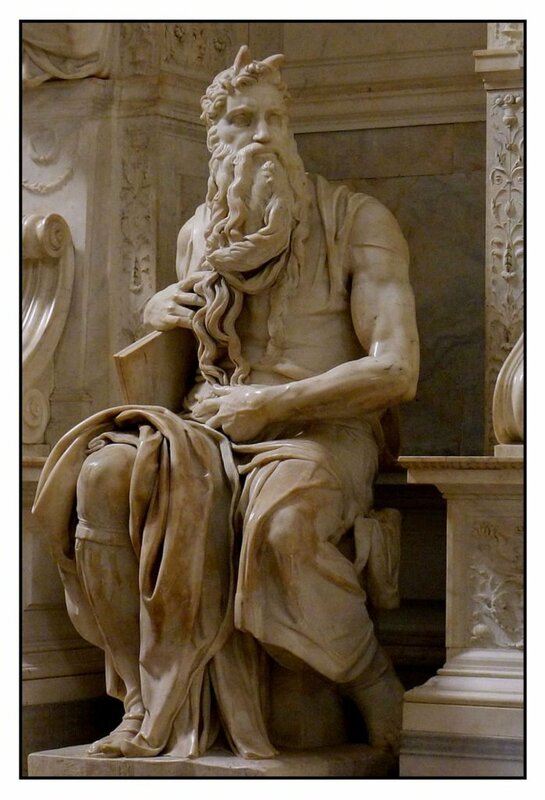 Michelangelo’s 1515 statue of Moses in Rome’s San Pietro in Vincoli Church shows Moses with horns. This unusual depiction derived from the Vulgate’s translation of Exodus 34:29 describing Moses after he came down from Mount Sinai. The Vulgate translated the Hebrew word karan as cornuta or “horned.” It is better translated as “shining,” – “because light radiates and protrudes like a type of horn.”(Rashi’s commentary). I have little knowledge of the Hebrew language. The following discussion of the interpretation of the third commandment therefore refers to others who know much more. The meaning of the commandment depends mainly on the verb nasa which is given in the second person (imperative) and on the word shua or shav used adverbially at the end of the commandment. But the chief benefit which religion conferred upon mankind, whether in ancient or in modern times, was undoubtedly the oath. The priests taught that if a promise was made in the name of the gods, and that promise was broken, the gods would kill those who took their name in vain. Such is the true meaning of the Third Commandment. Before that time treaties of peace and contracts of every kind in which mutual confidence was required could only be effected by the interchange of hostages. But now by means of this purely theological device a verbal form became itself a sacred pledge: men could at all times confide in one another; and foreign tribes met freely together beneath the shelter of this useful superstition which yet survives in our courts of law. In those days, however, the oath required no law of perjury to sustain its terrors: as Xenophon wrote, “He who breaks an oath defies the gods”; and it was believed that the gods never failed sooner or later to take their revenge. (Reade, 1872, p 153). However, this interpretation makes the third commandment similar to the seventh: “Thou shalt not bear false witness against your neighbour” (Exodus, 20: 16). One might differentiate the two by saying that the third concerns promises to do something in the future and the seventh testimony about something in the past or present, but both ideas require swearing. If the verb nasa is interpreted as “carry,” one can interpret the third commandment as forbidding hypocrisy. One must not present oneself as a follower of JHWH without living by his teachings. Matthew Henry said that the commandment prohibited “making a profession of God’s name, but not living up to that profession” (Henry, 1710, p 644). If nasa is interpreted simply as “take,” the meaning of the commandment is determined by the adverbial shav, which describes the way in which the name is not to be taken. This word shav is uncommon and difficult to interpret. It is usually translated as “emptiness” or “vanity.” The third commandment is therefore commonly interpreted as prohibiting the profane or trivial use of God’s name. The name of God should not be associated with angry expostulations – cursing in the everyday sense of the word. The sacred name should not be thus blasphemed. Shav can also mean “illusion,” “deception” or “falseness.” Thus the commandment can forbid the invocation of God’s name in magical conjuration (Buber, 1976, p 194; Alter, 2004 p 430) – cursing in the voodoo sense of the word. Sometimes, shav can mean a false thing such as an idol. Thus Staples (1939) suggested that the third commandment prohibited giving the name of JHWH to other gods – assimilating other false beliefs into the true faith. This interpretation, however, makes the third commandment merely a corollary of the first two. Some commentators have interpreted shav as related to shoah, which means “devastation,” “storm,” “disaster” or “destruction.” Childs (1974, p 411) also considers that the word may also include the idea of “malice” or “evil.” This is the meaning that I think the commandment intends: not to do evil in the name of God. This more general formulation would subsume those specific meanings already considered. The purpose of this command is to say “no” thoroughly and completely to that desire that lies so deep in the heart of man, the desire to infringe the freedom of God (Von Rad, 2012, pp 24-25). This idea is not easy to understand. God’s purpose is good. We should take care lest we subvert this purpose and do evil in His name. This is perhaps the true meaning of the commandment. Religion tends so easily to the position that believers are right and infidels are wrong. Ultimately, this leads to idea that the infidels should be destroyed. Much of the Hebrew Bible describes how the Israelites waged war on those who did not believe in their God. The times have not changed. In the past fifty years, factions within all major religions have committed atrocities in the name of their God (Juergensmeyer, 2003). The initial move is to discriminate between an in-group and an out-group, with a set of practices and/or beliefs that function as signals of commitment to the in-group. Next, there is a differential in moral evaluation of the two sides of the divide: The in-group is owed a higher level of moral consideration and accorded a greater level of moral protection than those outside the group or those who defect from the group. Thus far, this structure is not unique to religious violence, it simply flows from the basic evolutionary strategies for allowing systems of reciprocity to develop and group cohesion to form. Religion comes into play with the integration of one or more minimally counterintuitive concepts (e.g., gods) into the moral matrix. God comes to represent the moral bonds that hold a community together and functions as both legislator and enforcer of the group’s moral code. This gives that moral code a heightened sense of significance and obligation. Commitment to that god can then function socially and psychologically as a signal of commitment to the group. Also, by clothing the social code of the group in divine authority it can relieve the individual of responsibility for the consequences of his or her decisions (“If god commands, I must obey”). Consequent to this is that the out-group, by virtue of being the out-group, is not aligned with that god, or is not in proper relationship to that god. This further distinguishes the moral status of the two groups and leads to an escalation of the stakes at play. This becomes even more dramatic in universalist systems. In this case the out-group is not simply “other” but, in being aligned against God, is in league with evil itself. Inter-group conflict is no longer simply a competition between two groups seeking to promote their own interests, it is now a cosmic struggle with no middle ground available, and nothing short of victory acceptable. (Teehan, 2010, p 174). I am not interpreting the Decalogue as the word of God. Or at least not in the sense that a God dictated it to Moses. Whatever one’s beliefs, the Ten Commandments are an impressive summary of the principles of human morality. They concisely delineate the behaviors that we have learned to forbid for the benefit of human society. And I am not interpreting the God of the first three commandments as necessarily existing. Or as being a person rather than a universal force like in the Eastern religions. God could easily be considered as the abstract representation of human purpose and morality: what we have set as our goal and how we wish to get there. Human beings think in this way. To do away with such religion is to remove a powerful force for good. The problem with the idea of believing either in a real God or in an abstract principle that we call God is that it makes us think that we know the truth. We then consider those who think of God differently and those who refuse to accept the idea of God as misguided. Perhaps even evil. Since violence is part of our nature, this may sometimes lead us to do terrible things – and to do these in the name of God. I think that those who put together the Ten Commandments had some inkling of these problems. One should not use the name of God to justify actions such as murder that are forbidden by the later commandments. Those who counsel murder in the name of God are false prophets. I am suggesting that the third commandment urges us not to use God’s name to justify evil. Alter, R. (2004). The five books of Moses: A translation with commentary. New York: Norton. Buber, M. (1946). Moses. Oxford: East and West Library. The chapter “The Words on the Tablets” on pp 119-140 is reprinted in Herberg. W. (Ed.) (1974). The writings of Martin Buber. New York: New American Library. Childs, B. S. (1974). The book of Exodus: A critical, theological commentary. Philadelphia: Westminster Press. Durousseau, C. H. (2014). 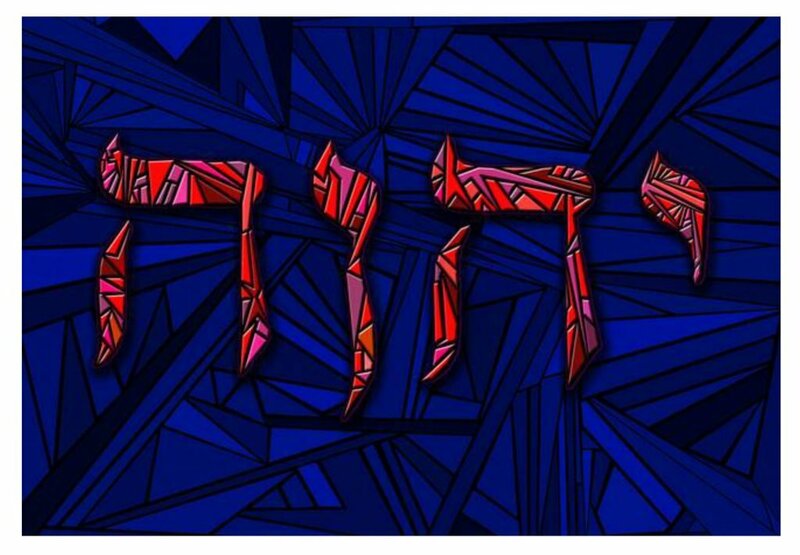 Yah: A name of God. Jewish Bible Quarterly, 42, 21-26. Gianotti, C. R. (1985). The meaning of the divine name YHWH. Bibilioteca Sacra, 142, 38-51. Hazony, D. (2010). The Ten Commandments: how our most ancient moral text can renew modern life. New York: Scribner. Henry, M. (1710) Commentary on the Whole Bible. Volume I. Genesis to Deuteronomy. Available at Christian Classics Ethereal Library. Jacob, B. (1940, translated by W. Jacob and Y. Elman, 1992). The second book of the Bible: Exodus. Hoboken, N.J: Ktav. Juergensmeyer, M. (2003). Terror in the mind of God: The global rise of religious violence. 3rd Ed. Berkeley: University of California Press. Meyers, C. L. (2005). Exodus. Cambridge: Cambridge University Press. Reade W. (1872). The martyrdom of man. Staples, W. E. (1939). The Third Commandment. Journal of Biblical Literature, 58, 325-329. Von Rad, G. (1940, translated by Neill, S., 2012). Moses. Cambridge, UK: James Clark.